Baron Hurricane Index – World Winds Inc. The Baron Hurricane Index (BHI) was created to help broadcasters accurately and concisely explain the tropical environment to their viewers. 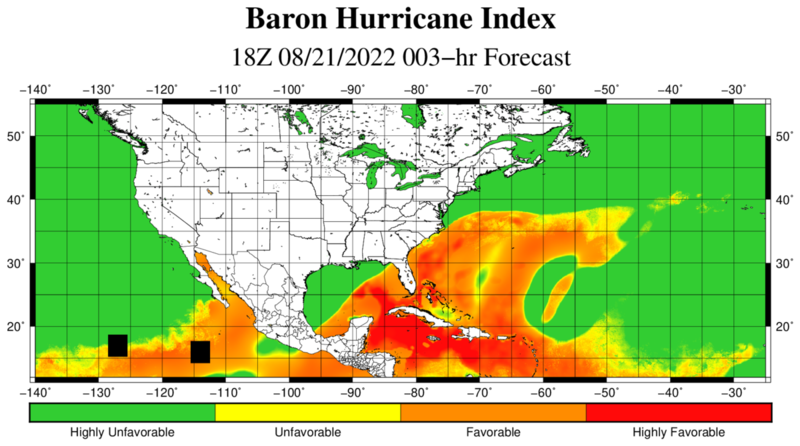 WorldWinds provides several products that describe pieces of the atmosphere’s ability to support the development and strengthening of tropical systems including: High Resolution Sea Surface Temperatures, 200mb – 850mb Wind Shear, Ocean Heat Content, Dust Concentration, and Total Precipitable Water. BHI combines these various factors to create zones of Favorability for tropical development and strengthening. Zones include: Highly Unfavorable, Unfavorable, Favorable, and Highly Favorable. Highly Unfavorable conditions are reserved for areas hostile enough to seriously hamper the development or strengthening of any storm that spends enough time in that region. Highly Favorable conditions are reserved for areas of the atmosphere that are near ideal for every condition considered in the BHI. Case studies were completed on several storms to examine the skill of the BHI algorithm. The results were all successful and can be viewed by clicking on a case study below. The lone exception is Hurricane Sandy, which maintained strength and even strengthened slightly, despite being in a “Highly Unfavorable” environment for much of its last 5 days. This is because Sandy was extratropical and being influenced by baroclinic processes. BHI, however, is tuned for tropical environments only.